We’re in a small airplane now, considering how Pottstown geographically connects and relates to its region. How do the uses and zoning along its borders complement or conflict with neighboring municipalities’ uses and zoning? Note the major manmade and natural features of the landscape: railroad tracks, highways, bridges, industrial areas, schools and playgrounds, parks and green spaces, the river, the creek. You can try to also let your eyes only notice one category at a time – just the roads, or just the green spaces – to further imprint how things connect… or don’t. Still up in that plane, let’s consider how all the groups and individuals in the community (the ones we talked about in the last post) interact with and represent Pottstown to the outside world of the county, the state and federal governments (regulatory agencies and funding sources), private foundation funding sources, and the private sector. What is the quantity and quality of those interactions? How can they become more positive, active and productive, so that the Borough can get its due? Especially in these difficult times, how can the Borough become more competitive for a bigger share of whatever funding and economic growth there is to be had in the region? Let’s land the plane and head to our computers. I said in my first article that your zoning tells you who you are and who you want to be. That wasn’t quite the bottom line. Your Comprehensive Plan is actually the foundation that underlies the zoning. The Pennsylvania Municipalities Planning Code is the legislation that enables communities “to plan their development and to govern the same by zoning, subdivision and land development ordinances, planned residential development and other ordinances, by official maps, by the reservation of certain land for future public purpose and by the acquisition of such land; to promote the conservation of energy…” It allows for planning commissions and zoning hearing boards. In short, it sets up the rules for the whole system of land development in the state. Comprehensive Plans are divided into sections that address specific community concerns and needs: statement of objectives, land use, housing, transportation, community facilities & utilities, statement of interrelationships among plan elements, discussion of short and long-range implementation strategies, statement of compatibility with neighboring municipalities, and a plan for the protection of natural & historic resources. In many communities, the adoption or update of a comprehensive plan results in well-attended, lively public meetings because they know that this document may result in zoning changes which literally touch everybody where they live. Comprehensive Plans are supposed to be updated at least once every 10 years. Pottstown last adopted its own Comprehensive Plan in 1986. More recently, it has used as its guiding planning document the Pottstown Metropolitan Regional Comprehensive Plan, which was done in 2005 and is in the process of being updated now. Other communities participating in that plan are: Upper Pottsgrove, Lower Pottsgrove, West Pottsgrove, New Hanover, Douglass, East Coventry, and North Coventry. If you go to the Montgomery County Community Revitalization Program page of their website and click on the Projects Summary – Completion Through 2009, you’ll see that Pottstown has gotten $3.4 million since the program’s inception in 2000. Only Norristown has gotten more at $5.9 million. The “X”s show work completed. The X for the 2006 Homeownership Initiative, Phase 3, should appear further to the right to indicate it was “partially completed,” but wordpress seems to want to put it right after the text. Here are just some of the planning tools that the County has developed for use by its municipalities: state-of-the-art model ordinances, a newsletter called Planning Perspectives, and Planning by Design, bulletins that clearly describe design considerations in ways an average citizen can understand. Suffice it to say that even with the County as part of the Pottstown Partnership, there needs to be renewed efforts – especially in this time of spending freezes and private sector slowdown – to get/to keep the Borough’s development priorities front and center with the County. In that sense, Pottstown has to take charge of its own destiny. Okay, so I’ve spent a lot of time on the County, but the importance of this relationship cannot be overstated. The County is a planning and policy partner as well as a funding source, and the Borough needs to be working positively and pro-actively with them on every level. I really don’t know all the ins and outs of how they work together, so it’d be great if people could comment on that. Radiating outward, real quick… the Borough should put itself out there as a spokesperson for the redevelopment and revitalization challenges facing older, developed communities. That means being an active participant in the conversations about First Suburbs, the PA Land Bank legislation, the Delaware Valley Regional Planning Commission’s policies and funding schedules, the County’s regional planning issues, and even federal community development funding priorities. First and foremost, the Borough’s got to start achieving some success in its own revitalization efforts. But along with that, if it makes itself visible in these broader arenas, and makes its voice heard, it could improve its chances to move toward the front of the line when it comes time to receive the ever-dwindling funds that are out there. There’s more radiating outward to be done. I’ve got to wrap this up and we didn’t even get to the Keystone Opportunity Zone, or the private sector, or consumers with money! I’ll have to cover those in the next post of the series. Note: I’m going to Bethlehem today with a contingent from Pottstown to check out Musikfest and learn how Bethlehem used arts and cultural development as an economic redevelopment tool. I took a continuing ed class on this kind of stuff last year and can’t wait to see this particular example in action. I’ll be sure to report on it asap. Hi Sue, I hope you enjoyed Musikfest! Hey, speaking of the county, a year ago there was a lot of hype about how there was 60 million dollars coming to “blighted towns” – specifically Pottstown and Norristown. I am all for applauding for the 3.4 million we’ve received but um, where is the rest? Are there hoops the town has to jump through in order to release those funds? Hi, Mo! Musikfest and the meeting with the founder were great! More fodder for a near-future post. Re: additional funding, I don’t have an answer. There’s so much more drilling down I have to do to get a clearer view of all that might be available, or what may be frozen due to budgetary constraints. My brain is very tired now, so I’m going to stop here! IF I’m hearing you correctly (without yet looking at the many links you’ve graciously provided) the regionalization is a key componet to survival. Taking that a step further, developing and maintaining positive and productive relationships with neighbors is critical to the resolution to become a vibrant town, once more. Who wants to just survive – we should aspire to thrive, right? We should not view our municipalities as competitors for county, state or federal funds – rather, shouldn’t we be fluent enough with regional and county issues to applaud eachother for the many ‘baby steps’ we take toward brighter days and offer partnerships when possible. There is also merit to the theory of lessening the number of SDs and governments for a more streamlined process and less ‘middlemen’ (in my mind). I do understand sometimes it comes down to issues of pride for your municipality but haven’t we seen how problems spread like disease. Remedies will only last so long – a vaccination would be a more permanent fix and one that could be shared once the ‘code is cracked’! I believe in success for more than our fair town and hope that we can stand tall to get a prescription for our ills. Then, when we are on the path to glowing health we reach out to others to share our success. We must change with the times and embrace changes and new thoughts or the plans of 1986 will restrict our potential. Great stuff, Sue!! This is like being enrolled in school – I’m learning so much! Your comments help crystallize in my mind a few more important points. First, there actually are situations where neighboring municipalities ARE competitors, if not directly for funding, then for the policy decisions that heavily influence the flow of private and public capital spending. The recent discussions around the 422 bypass are a case in point. Pottstown now seems to be at the mercy of major transportation policy decisions that affect where businesses, people and money flow. It needs to get out in front of those conversations – participating in them in more public forums and in meetings with the county. Pottstown needs a more unified, reasoned and vocal position on what is in its best interests — which I might add will also be good for the region. The planning & public policy people all know this as well; it’s not rocket science. This assumption is at the heart of all smart growth and sustainability planning. As you say in other words, Pottstown’s problems can, do and will continue to emanate outward, and that is not in anyone’s best interests. 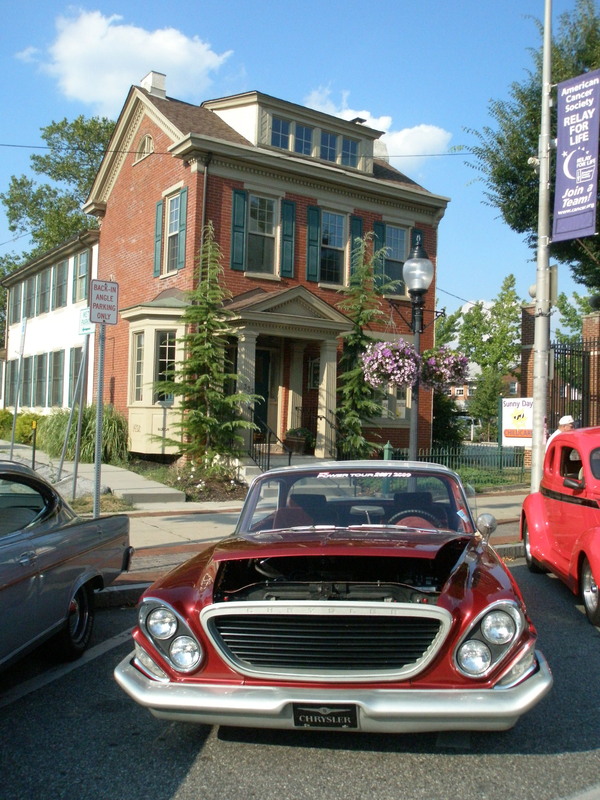 Pottstown as a thriving commercial and social center is good for everyone. Second, there may not be much head-to-head competition with neighboring municipalities for funding because there are incentives and programs specifically for places like Pottstown – like the Keystone Opportunity Zone, or a Main Street program, and some new federal pots of money – that are just not available to wealthier, sprawling suburbs that have no downtown. For those programs, Pottstown’s competition comes from other similar towns across the county, state or country. Pottstown needs to position itself at the front of those lines.